The face of Turkey has changed, perhaps forever. On Saturday, the Turkish parliament voted 403 in favor and 107 against (out of the total of 550 M.P. 's) for a constitutional change that would permit an easing of the ban on the "hijabs," or headscarves, worn in public by women of the Islamic faith. This step is seen by some as the beginning of the end of the Ataturk era, which began in 1923 when Kemal Ataturk founded a republic based on the strictest principles of secularism. Out of the ruins of the fallen Ottoman Empire, Ataturk almost single-handily built the institution and drafted the constitution on which the state functions. Saturday's vote is a troubling sign of the eroding authority of the secular state and the creeping Islamization of Turkish society. In order to become law, the parliamentary vote must receive presidential assent. That's almost assured. Turkey's recently elected president, Abdullah Gul, is an avowed Muslim whose wife wears the headscarf publicly if discreetly. He is certain to approve the controversial vote. Tens of thousands of people who are against the wearing of the headscarf in public institutions marched outside parliament during the voting procedure. If the lifting of the ban is adopted, secularists and more-traditional Muslims are likely to collide. At stake is what remains of Turkey's secular tradition. Last year, there were heated verbal clashes between the secular and religious elements in the country. This was played out last spring in mass rallies in the streets of Istanbul as people protested against the presidential candidacy of Gul, who belongs to the A.K.P., or Justice and Development Party. The military sees itself as the last line of defense in the battle to contain the rise of Islam. It also sees the office of the presidency as a symbol of secular rule. Last September, another parliamentary vote saw Gul's ascent to the highest office in the land, putting a "moderate Muslim" in the presidential palace. Moreover, with the inevitable lifting of the ban on headscarves, the guardians of secularism (mainly the military) fear further erosion of the secular republic. When I visited Turkey last summer, the growing influence of Islam was visible on the streets of Istanbul. This is due, the locals told me, to the influx of provincials with conservative customs into the big cities such as Istanbul. It is almost as if the more-liberated women are becoming outnumbered by the hijab-clad crowd. The pro-A.K.P. Zaman reported on the comments made on Saturday by hard-line "Kemalist" Deniz Baykal, who is the leader of the C.H.P., or Republican People's Party. Baykal made not-so-veiled threats alluding to the dangerous consequence of making the nation's legal document more Islam-friendly. Baykal implied that a total overhaul of the current constitution could not be accomplished by peaceful means: "Of course it can [be amended]: You chase away the enemies and found the country from scratch. You erect your flag. It has already been done.… You can stage a revolution, risk being hanged. And after that the entire constitution can be changed." But, he warned, "We have been elected to implement the constitution, not to draft it. It would be wrong if we attempted to cancel the current one and make a new constitution." 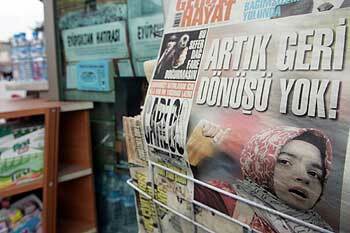 His party plans to block the lifting of the headscarves ban at the constitutional council, Turkey's Supreme Court. Turkey's most powerful neighbor, Iran, a regional power in its own right, is most likely watching these trends very closely. A more Islamic-looking Turkey, where headscarves are increasingly visible, would certainly drive the country further eastward and distance it from the European Union, which Ankara desperately wishes to join. As Turkey slowly eases down the road to increased Islamization, it could one day become a "Sharia state" like Iran. According to columnist Mustafa Akyol, writing on Saturday in the Turkish Daily News, such fears are a bit far-fetched: "Truly there are still marginal Islamists in Turkey who dream of a "Sharia state," but the majority of the Islamic circles, and their political representatives, ask for religious freedom, not religious tyranny. They don't speak about forcing women to wear headscarves, they only ask for equal rights for the women who [choose to] wear them." The fine line between the greater religious tolerance espoused by the ruling A.K.P. and Turkey's often militaristic and somewhat oppressive solution for dealing with Islam's influence in society is a difficult tightrope to tread in the post-Kemalist period. The headscarf issue may just be the breaking point heralding much tumult ahead.